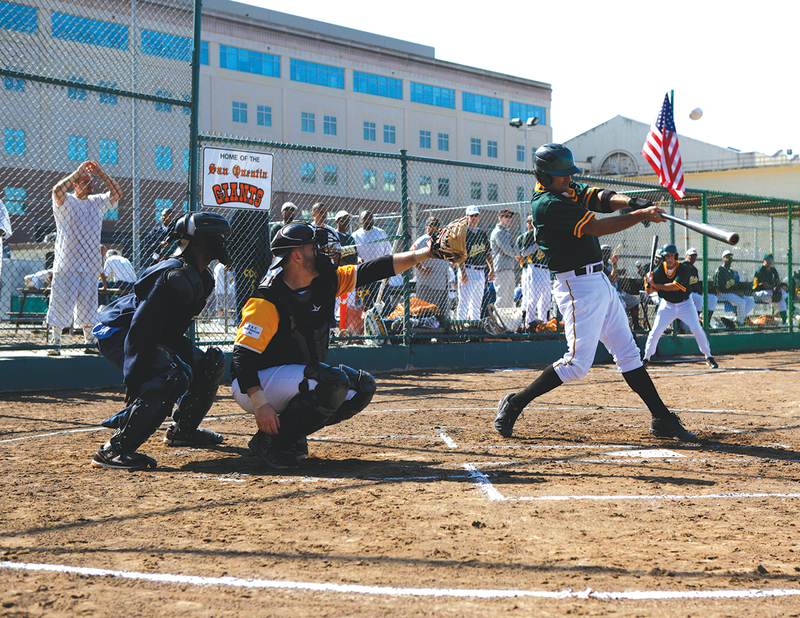 Strong pitching by the San Quentin A’s easily knocked off the visiting Sacramento Pirates 8-4 in a late July contest. The game marks the first visit for the Pirates, who are part of the Sacramento Senior Men’s League for those 35 and over. The A’s ace pitcher J. “Duey” Dumont dismantled the Pirates’ batting core with surgical precision. He threw curveballs, fastballs and sliders with the poise of a professional. He sent at least five Pirates back to the dugout after striking out. The A’s dominated the first four innings, racking up a 5-0 lead through power hitting and solid base running. But the Pirates didn’t lie down. In the fifth, they found creases in the A’s defense. The Pirates hit singles between the shortstop and third base. A walk helped them load the bases. Chavo de la Cruz smashed a double to center-field to score two runs and closed the gap 5-2. “This is not your everyday experience,” said Elias Mendoza, Pirates pitcher. “With all the racism going on in the society, you just can look at the diversity on both our teams. It’s not about your color or your size; it’s about your talent. “I know this is not your stereotypical prison yard, but I do know this program is a great incentive in these circumstances,” Mendoza added. The Pirates tightened their defense, making diving and sliding catches to end innings and keeping the game within reach. They added two more runs in the seventh with RBI’s from Levi Williams and Chad Carrington. The Pirates felt a comeback on the way. They slapped a round of high fives as the scoreboard reflected a 5-4 game. But the Pirates’ cheers were short-lived as the A’s scored three runs in the eighth. The A’s Leigh Olden smashed a big double to rally the team. Veteran Brandon Terrell Riddle whacked a deep triple to center field and Olden scored. Terrell scored off a single. The A’s added another run for the 8-4 lead. Dumont took the mount to close the game. He stared down the next three batters, fanning one and ending the contest on a fly ball. “Duey pitched a terrific game,” said A’s John “Yah Yah” Parratt, inmate president of baseball operations. “Everybody played, everybody hustled. We did a good job all around. “We thank the Pirates for coming in and giving us their time. I think they will go out and spread the word about the program,” Parratt added.